In April, teams travelled to Long Beach for round-three of the 2013-season. This was the thirty-ninth running of the Long Beach Grand Prix around the 1.968-mile eleven-turn temporary street circuit. 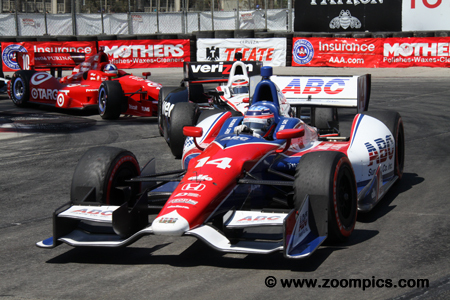 In 2013, Takuma Sato switched from Rahal Letterman Lanigan Racing to drive for A.J. Foyt Racing. 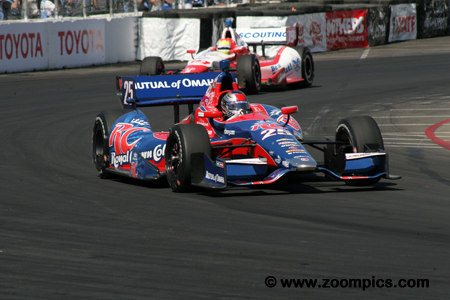 It appeared that the change agreed with Sato as he won his first IndyCar race. This also marked the first IndyCar victory for a Japanese driver. The ex-F1 driver qualified fourth and took a lead on lap-50. He did relinquish first place for the remaining thirty-laps. 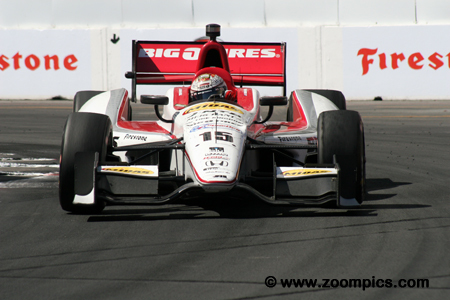 A driver that moved through the field was Graham Rahal. 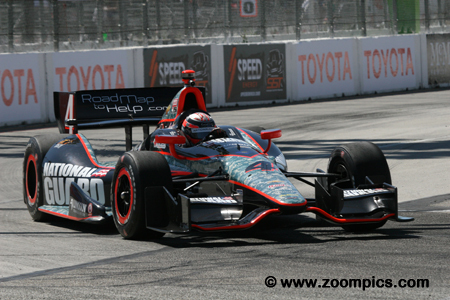 Rahal started eleventh but after eighty-laps, he was second in the Rahal Letterman Lanigan Honda-powered Dallara DW12. During his racing career, Graham’s father, Bobby, had four second place finishes at Long Beach. Another team making tremendous progress during the race was the Dale Coyne Racing Dallara DW12 Honda driven by Justin Wilson. Wilson qualified a lowly twenty-fifth but captured the final spot on the podium. This was accomplished through a unique pit strategy which resulted in the Coyne team being out of sequence with their competitors. 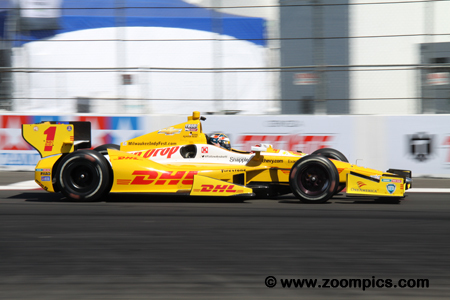 Defending series champion, Ryan Hunter-Reay in the No. 1 Andretti Autosport Dallara DW12 Chevrolet started second. The winner of round two at Barber Motorsport Park was the quickest of the Andretti Autosport drivers. 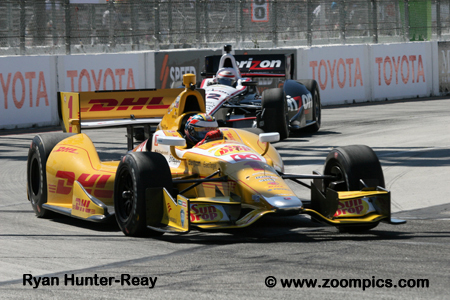 Hunter-Reay’s race ended on lap-49 when his overly aggressive driving caused him to hit the tire barrier a turn-eight. 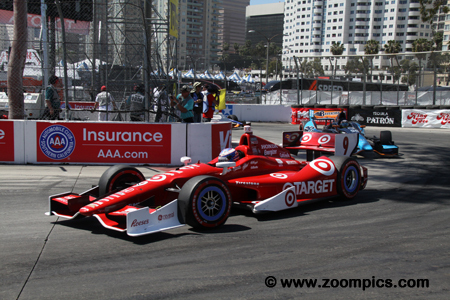 Target Chip Ganassi Racing driver Dario Franchitti started from the pole position. This was Franchitti’s thirtieth pole in his Indy car career. With the exception of lap-7, he led the first twenty-eight laps. A combination of poor pit-stops and bad restarts during the event dropped him to a fourth place finish. 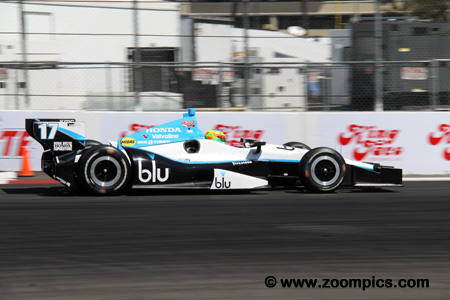 Just prior to the 2012 season finale at Fontana, California, Mike Conway, made a decision to no longer compete on ovals. As a result, he did not have a full-time ride in 2013 but his road racing skills were recognised by many teams. At Long Beach, he drove for Rahal Letterman Lanigan Racing and started fifth but retired on lap-38 with an electrical issue. Son of team principal, Marco Andretti, was penalized for interference during qualifying. The Andretti Autosport driver started his Chevrolet powered Dallara DW12 third last - the twenty-fifth position. 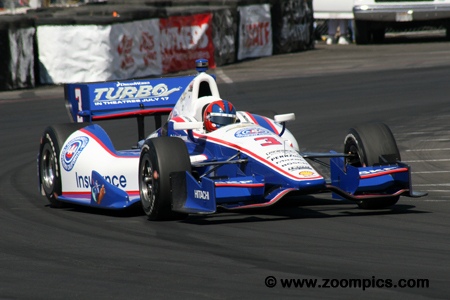 However, it came together for Andretti during the race and he worked his way up to a seventh place finish. In 2013, Andretti Autosport was expanded to a four car team with included defending champion Ryan Hunter-Reay, E.J. Viso, Marco Andretti and James Hinchcliffe. Canadian, Hinchcliffe replaced Danica Patrick in the No. 27 GoDaddy sponsored car. 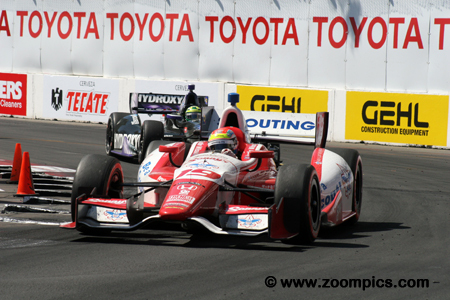 At Long Beach, he qualified seventh but contact with Tony Kanaan on lap-34 in turn-one forced Hinchcliffe to retire. Team Penske driver, Helio Castroneves led the championship standings on the basis of podium finishes at St. Petersburg and Barber Motorsport Park. He started sixth at Long Beach in a Chevrolet powered Dallara. During the race, Castroneves dropped down the order after an incident which damaged the nose of the car and was tenth at the checkered flag. Despite this result he left the event with his points lead still intact. 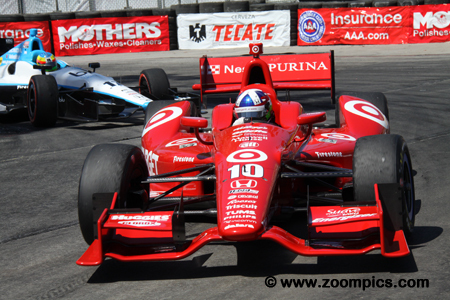 At Long Beach, Scott Dixon was not as successful as his Target Chip Ganassi teammate Dario Franchitti. The 2008 IndyCar champion started in the twenty-sixth position – the result of a brake problem during qualifying. Dixon had an incident on lap-1 with Tristan Vautier which dropped him down a lap. Despite the damage, he improved on his position and took the checkered flag in eleventh and left Long Beach third in points. J.R. Hildebrand drove a Chevrolet powered Dallara for Panther Racing. At Long Beach, Hildebrand started twelfth and had his best result of the season when he improved seven spots and was fifth at the checkered flag. The podium finishers are taken for a lap to celebrate their results with the fans. On the left is Rahal Letterman Lanigan driver Graham Rahal and Justin Wilson of Dale Coyne Racing is on the right. 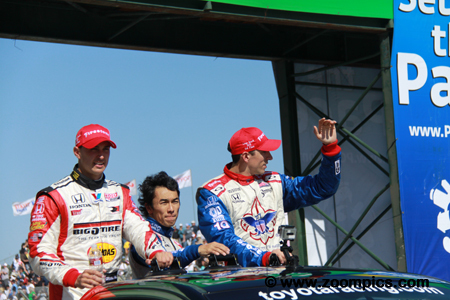 In the center is Takuma Sato enjoying his first IndyCar victory after fifty-two starts.